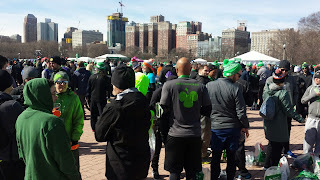 My goal race - The Shamrock Mile - was the day before, so I planned that the Shamrock Shuffle 8k was going to be just for fun. 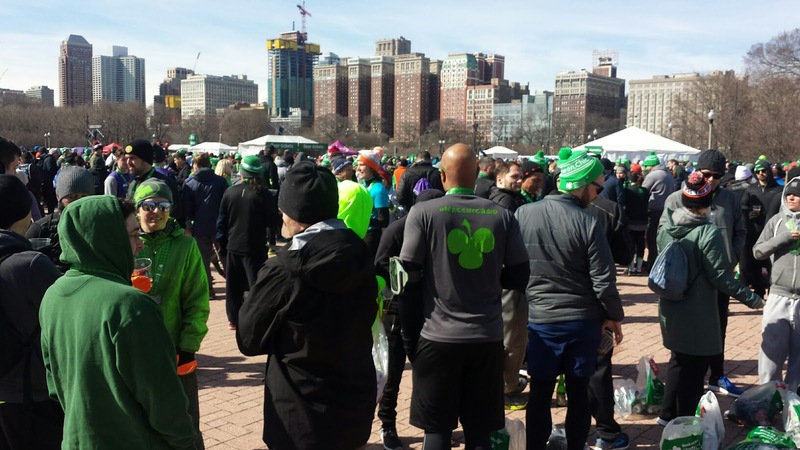 However, as anyone who reads this blog knows, I simply can't just run for fun! Plus I was running for the MRC team this year and I wanted a decent AG finish to score points (or less points!) for them. The only real calculation I did prior to the race was to check my average weekly mileage 12 weeks before the race vs. last year. This year I was at 32 miles per week and last year 30 miles per week (when I ran a 31:08 - remember that number). So, I actually had a tiny bit more base than last year. I really didn't do any more exacting calculations as to what my 8k fitness level was, despite having a 5:36/mile to work with from the race 18 hours before. The 5:36, put me at about a 32:00 8k, but I hadn't bothered to look it up, because you know, I was trying to chill. I woke up at 6:00 a.m. and went for a one mile shakeout run around my neighborhood. Temps were hovering around 40 degrees and there was a slight wind. I made coffee, scarfed down bacon, an egg and a banana. After letting the dogs out and getting them back inside, I drove down to the race and to park at a new $10 garage. Unfortunately, Columbus Ave was already blocked off so I had to spend an extra 10 minutes driving west to approach the garage using the bridge over Columbus. I was in a hurry to get to the MRC pre-race photo op and time was ticking. So, I parked quickly and sprinted over to the meetup area with what turned out to be plenty of time to chat with the MRC team. I checked my bag with about 15 minutes before the corrals closed, so I did a slow jog for 5 minutes then did some fast pickups for another 5 minutes. Once in the corral, I spotted the MRC group and saw Xaarlin and company. I then made my way up closer to the start line. I spotted John B who hadn't raced in over a year and we shared how good it felt to be back at it for the Shuffle. The national anthem was sung and we were off. Mile 4: I crossed the 5k timing mat at 19:43 which was 21 seconds slower than my time at the same point last year. I guess I had really been holding back. I typically love to step on the gas at this point in the race and since my lungs and legs both felt great, I proceeded with Operation Pass Lots-o-Fading-Runners! 6:09/Mile. Mile 4.97: I relish the long straight stretch southbound on Michigan Ave. This is where the footrace begins since there are no turns and you can see everyone ahead and you. You can also see where the footrace will end with Mt. Roosevelt looming in the distance. This is where I spotted a guy I knew was in my AG and quickly put him behind me. For extra motivation I told myself that I needed to stay ahead of him. I kept the speed up thinking that he might be on my heels. We made the turn onto Roosevelt Rd and then I flew uphill and then with all my might down to the finish line! 5:59 /Mile. I am proud of the negative split. Unlike last year, when I positive-splitted, I never really felt like I was red-lining until the very end. Despite the "same" finishing time, I even moved way up in my AG standings thanks to the new AG! Fun stat: according to the results, I passed 58 men in the last 1.9 miles! For some reason, I found myself walking down the chute alongside Deena Kastor, who moments ago set a world masters 8k record. She was talking about how her lungs felt fine, but she couldn't get more speed out of her legs! Anyway, I mentioned to one of the course volunteers that Deena Kastor was walking by her. The volunteer asked me if she thought that Deena would let her take a picture of her. So I asked Deena and she said yes, but that the volunteer had to get in the picture with her. So I took her phone and got a picture of the two together! MRC and Beer (last year)! I offered John B a ride then we headed back to my car stopping off at Starbucks first. I like where I am fitness-wise and generally feel better rested and less burned out than I have. As for goals, I'd like to make a strong age group showing the day before my birthday at at the Run For the Animals 10k in June. However, before that happens I'll get a tune up at another CARA race - the Ravenswood Run 5k at the end of April! Who knows? I might even be a late entrant for the CARA Lakefront 10 Miler! Didn't you get a photo with Deena? 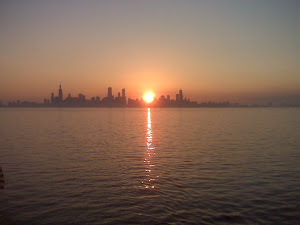 I'm debating whether or not to drop down to the 5k for the Lakefront 10. I'm not well trained for it since I haven't been feeling well. Congrats on your awesome finish! I love your Operation Passing-lots-o-Fading-Runners. Sigh... I miss those days. I didn't have my phone yet, since we were just exiting the chute. Maybe I should have gotten a picture and the woman could have emailed it to me! See you tomorrow. Great race for you, Pete! Congrats! Bummed I didn't see you. Awesome job Pete! Way to go! You Need a Pair of Knockaround Sunglasses! 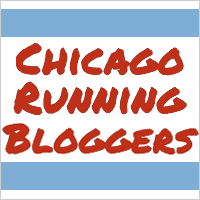 Who Are the Runners in Chicago? Team Run for HD - year 3. "Suddenly, the town gloom ended in a flaming blue teeter of fresh water, from the black shore-ends down into the golden whiteness eastward." "The Adventures of Augie March"